In September, Ms. Donna Tripi, Principal of La Jolla Elementary School, sent an e-mail Blast in which she warned parents to be “vigilant” regarding a man thought to be an “African American male.” On Monday of this week Ms. Tripi issued an apology. The apology is as disturbing as the original e-mail message. She repeats the description of “the Man,” mentioning his race, but not that of the parents, the children, or her race. This repetition reinforces the idea that these parents, their children, and all who read the communication have something to fear from African American males. The passive voice used in the “apology” conveys the writer’s unwillingness to take full responsibility for perpetuating racist stereotypes about African American males. One wonders what she is apologizing for when she writes, “I spoke to the parents directly and am confident the concern they described was not imagined.” What concern did they describe? That they were uncomfortable being in the presence of African American men? This self described “leader” issues an apology in which she reiterates that, “We want parents to be vigilant, . . . .” A so called “apology” in which one reiterates the need for vigilance (“watching for possible danger”) in the presence of African American males, and in the context of an event in which the subject is supposedly an African American male, is no apology at all. It is continued race baiting. Ms. Tripi says clearly in her original e-Blast from La Jolla Elementary School that “nothing happened due to the vigilance of the parent, . . . .” This outrageous assumption that there was some danger that this parent had to fear is what deserves an authentic apology. The fourth bullet in the e-Blast from La Jolla Elementary School is especially disturbing: “If you see something that doesn’t feel right, report it to the non-emergency police line . . . .” Ms. Tripi should understand that with this direction, she is contributing to countless more individuals not feeling right in the presence of African American males. Moreover, she can be assured that many more innocent African American males and females will have unpleasant encounters with police officers inquiring about their innocent, lawful behaviors because someone was uncomfortable with them just living their lives. We continue to be disturbed by the last line of the e-Blast from La Jolla Elementary School: “We’re all hoping it was an isolated incident, but reminders are always helpful.” AN ISOLATED INCIDENT OF WHAT? Seeing an African American male? We can assure Ms. Tripi that she and her constituents will see many more African American males—and they may be wearing hoodies—and Ms. Tripi and all readers of her communications have no more to fear from African American males than they do from white males in hoodies—or suits and ties. While we appreciate the work involved in producing the CAPER report, the reality that it contains is quite alarming. 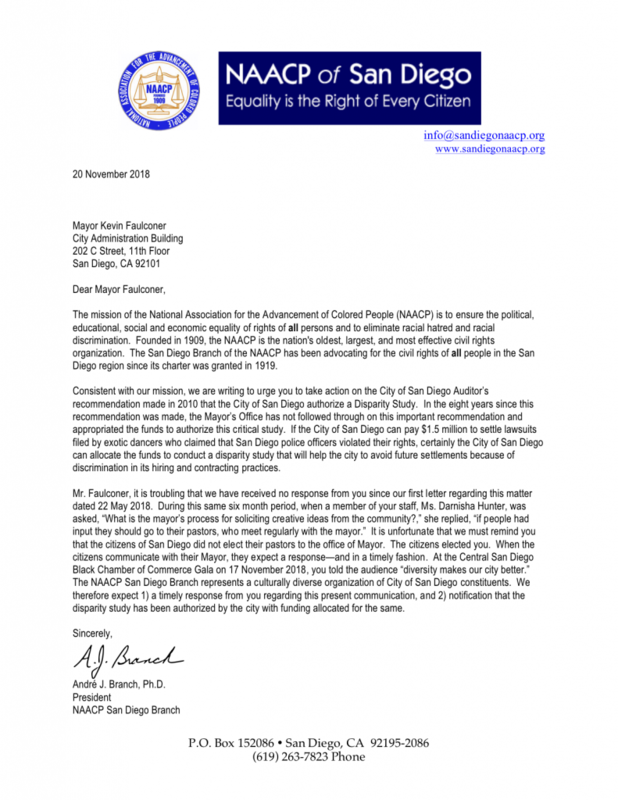 The San Diego Branch of the NAACP Housing Committee has many unanswered questions about the report, far too many to note here. However, the most glaring and distressing, in terms of what we understand as HUD regulations, is the report on Minority and Women Owned Businesses. 3. ONE HUNDRED FIFTY THREE went to white non-Hispanic males. We would like this information to be explained in detail in the final report and we would like to understand your justification for these results. These numbers directly contradict the spirit and letter of the purpose for the Department of Housing and Urban Development. These figures put in jeopardy future federal funds that would come from HUD to the city of San Diego. There are many more causes for concern in the report and we will comment on those at a later time. We look forward to the final report and welcome the chance to cooperate on some of the problems that will be ongoing for some years in the future. Nearly $73M and not a penny to a business owned by a person of color. Can’t believe it? Read the full FY18 Draft CAPER Report on the City’s website.